Jarrod Ramos suspect was there to kill as many people as he could’. 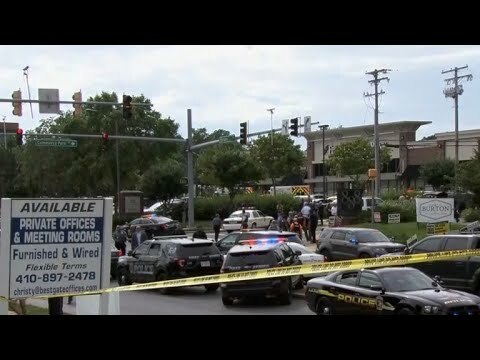 Four journalists and a sales assistant were killed and two others were injured Thursday after Jarrod Ramos allegedly opened fire on employees inside the office building of the Capital Gazette, a local daily newspaper in Annapolis. Police said they aren’t looking for additional suspects and believe Jarrod Ramos acted alone. Tom Marquardt, a former editor and publisher of the Capital Gazette, told ABC News that Jarrod Ramos had previously filed a defamation lawsuit in 2012 against the newspaper following a story about a harassment case in which Jarrod Ramos was the defendant. Marquardt, who worked at the newspaper for 35 years before retiring in 2014, told ABC News he once received a death threat from Jarrod Ramos and alerted authorities. Police investigated but didn’t have enough evidence to file any charges against Jarrod Ramos, according to Marquardt. Court documents show that Jarrod Ramos pleaded guilty to a criminal harassment charge in the District Court of Maryland in Anne Arundel County nearly seven years ago. An article about the case was published in the Capital Gazette five days later, written by then-staffer Eric Thomas Hartley. According to the 2011 article, Jarrod Ramos reached out to a former high school classmate on Facebook, saying he was having some issues and asked her for help. The woman, who was not named in the story, tried to help and suggested he seek counseling. “That sparked months of emails in which Jarrod Ramos alternately asked for help, called her vulgar names and told her to kill herself. He emailed her company and tried to get her fired,” the article said. Court documents show a judge placed Jarrod Ramos on 18 months of supervised probation and ordered him to continue therapy and refrain from any further contact with the woman or her family. A year after the story ran, Jarrod Ramos filed an initial complaint against Hartley, Marquardt and Capital Gazette Communications, claiming he was defamed in the newspaper article. A few months later, Jarrod Ramos filed another complaint that added a charge of invasion of privacy. The case was ultimately dismissed. The Twitter account has since been suspended. Authorities have described the shooting as a “targeted attack,” saying the gunman “looked for his victims as he walked through the lower level” of the office building where the newsroom is located. Anne Arundel County State’s Attorney Wes Adams said Jarrod Ramos “hunted” his victims, including those who tried to flee. He even barricaded the back exit of the newsroom so employees couldn’t escape, according to Adams. Jarrod Ramos allegedly wielded a pump-action shotgun that was legally purchased about a year ago, according to Altomare. Police arrived at the scene of the shooting within a minute and apprehended Jarrod Ramos within two minutes. No gunfire was exchanged between the suspect and police. Anne Arundel County Executive Steve Schuh told ABC News that police found him hiding under a desk in the newsroom before taking him into custody. Police have identified the victims who died as Tom Fischman, Robert Hiassen, John McNamara, Rebecca Smith and Wendi Winters. Two other employees, Janet Cooley and Rachel Pacella, were treated for minor injuries and released from Anne Arundel Medical Center on Thursday night, according to a hospital spokesperson. Jarrod Ramos did not have a wallet or ID on him when he was taken into custody and refused to cooperate with authorities during an initial interview, according to the Anne Arundel Police Department. Investigators were unable to identify the suspect using his fingerprints due to a problem with a machine, law enforcement sources told ABC News. So they used facial recognition software instead, though it’s unclear whether it was from a photograph or a witness, the source said. Court officials told ABC News that when Jarrod Ramos arrived for an initial appearance around 1:30 a.m. local time Friday, the judge asked if he wanted an attorney. Jarrod Ramos apparently responded, “I’m not going to corporate.” A public defender represented Jarrod Ramos during his bail hearing Friday morning. The chiefs of the Anne Arundel County Police Department and the Annapolis Police Department told ABC News in an interview Friday morning that Jarrod Ramos was still not talking.